Earnings season kicks into high gear with Verizon, Coca-Cola, and Amazon all set to post quarterly results in the week ahead. 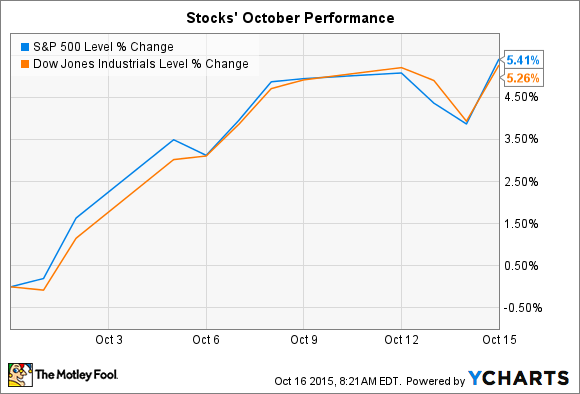 October is off to a great start for investors. Both the S&P 500 (SNPINDEX:^GSPC) and the Dow Jones Industrial Average (DJINDICES:^DJI) have surged higher by 5%, recovering more than half of the losses they sustained during a brutal August and September. Hopes are rising that an interest rate hike by the Federal Reserve may not happen this year, after all. But earnings season will be the focus for the week ahead. Dow giants Verizon (NYSE:VZ) and Coca-Cola (NYSE:KO) announce their third-quarter results in the next few days. And Amazon.com (NASDAQ:AMZN), the second-best performing stock in the market so far this year, posts its earnings on Thursday. Wall Street is expecting good news from Verizon to kick off the week. The telecom giant will post a 15% earnings boost, if the pros are right, to $1.02 per share. And sales are targeted to rise by 4% to just under $32 billion. Verizon's wireless business has been the key to its strong growth lately. Its customer base ticked up by 5% last quarter to reach 110 million users. But what's more impressive is the improving quality of that subscriber base. Verizon customers are upgrading to 4G devices at a strong clip while increasingly choosing installment plans to pay for the latest-and-greatest smartphone. Those two trends have resulted in sharp profit gains: Operating margin is at 34%, up from 32.5% in the prior-year period. But the best news for Verizon is that it just logged its lowest rate of customer churn, or subscribers canceling their service, in three years. If it can keep customers paying more for services and devices, that spells steady gains for shareholders of this dividend giant. In contrast, soda king Coca-Cola isn't expected to have a lot of good news for investors when it posts earnings on Wednesday. In fact, the company should announce a decrease in both revenue and profit, to $11.6 billion and $0.50 per share, respectively. With 60% of its sales generated outside the United States, Coke's results are especially sensitive to foreign currency changes that can cloud the picture on operating trends. Last quarter, for example, reported revenue fell 3%. But organic revenue, which strips out those currency moves, improved by 4%. That's why investors will likely look past Coke's sales numbers this week and instead focus on volume growth. That figure was held down to just 2% last quarter, thanks to a brutal 7% decline in the Diet Coke brand. But income investors aren't as concerned with weak growth as long as cash flow keeps improving. In an era of sinking earnings, cash generation is important to ensure that Coke's dividend keeps marching higher. Online retailing giant Amazon is a stock market favorite heading into this week's earnings: It's the second-best performing stock in the entire S&P 500, year to date. That fact sets up the likelihood for volatile trading around Thursday afternoon's earnings announcement, which is expected to include a 21% sales spike to $25 billion. Investors found a lot to like in Amazon's last quarterly check-in. Besides the hefty 21% revenue boost, gross margin rose by 4 percentage points as shipping costs ticked lower and third-party sellers took up a larger portion of the sales base. Meanwhile, Amazon's cloud services business clocked awesome growth -- jumping 81% to nearly $2 billion of sales. Investors will be watching for more hints on the company's long-term profitability potential. But they certainly aren't expecting any earnings at the moment. Amazon's $25 billion of third-quarter sales should generate an operating loss of as much as $500 million, according to management's latest forecast.